Bike lanes or parking? Soon, St. Pete city leaders will have to decide which will stay and which will go along the one-way 1st Avenue N and 1st Avenue South downtown. ST. PETERSBURG, Fla. — The city of St. Petersburg has 300 flashing beacons across the city to help pedestrians and cyclists cross intersections. They're used as a safety feature to help draw attention for drivers to know pedestrians are in the marked crosswalk. A recent St. Petersburg study found that 90 percent of drivers stop for pedestrians using the flashing signals. Without the lights, less than 5 percent of drivers stop. ABC Action News found two flashing beacons along 9th Avenue North within miles apart from each other not working. One of the faulty flashing beacons were near St. Petersburg High School. 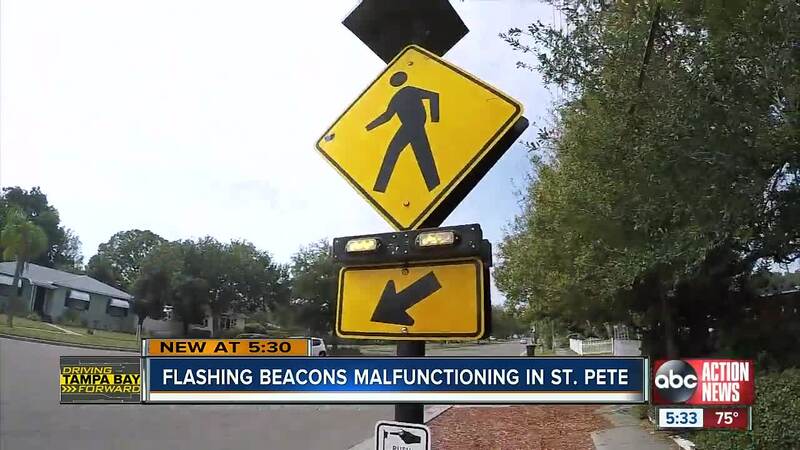 A spokesperson for the city of St. Petersburg tells us they are actually transitioning right now from hiring a private contractor to fix and maintain the beacons to city workers. The city does not drive around to check each flashing beacon daily, but they say they rely on information from citizens to help know if there is a faulty, inoperable crosswalk. The city prefers residents to call them directly, or report information to their Mayor's Action Center on SeeClickFix St.Petersburg.